Hadoop is a software platform to manage and mine large datasets, by allowing users of commodity servers access massively parallel computing. Hadoop has 2 main components – HDFS and MapReduce. HDFS manages data storage and administration. HDFS divides files into blocks of data, typically 64MB in size, then stores them across a cluster of data nodes. Any data task can then be performed over many large files stored on many machines. This eliminates many traditional limits on data processing including allowing for dramatic increases in data capacity. MapReduce is Hadoop’s main data processing framework, written in Java. To see how it works, imagine counting Irish authors in a library. MapReduce would delegate shelves to team members (i.e. divide data into blocks) who count Irish authors within their assigned shelves (the Mapper process). The workers then get together to add up their results (the Reducer process). As Java MapReduce can be complex, Apache have added projects to simplify its use. Streaming runs MapReduce scripts languages other than Java, Hive runs SQL-like queries in Hadoop while Pig performs SQL-like operations in a procedural language that users of R and Python might be more comfortable with. These are only some of the projects available and companies continue to find other ways to simplify the use of Hadoop such as online tools like Amazon’s AWS service, which includes S3 file storage (a similar file system to HDFS) and their Elastic MapReduce platform. Scalable – New nodes can be added as needed without changing many features of data loading or job construction. Also the scalability is linear i.e. doubling the amount of clusters halves the time spent on work. Cost Effective – Hadoop brings massively parallel computing to commodity servers with a sizeable decrease in the cost per unit. Flexible – Hadoop can absorb any type of data, structured or not, from any number of sources, enabling deeper analyses than any one system can give. Fault Tolerant – When a node is lost, work is redirected to another node in the cluster. Speed – Hadoop is not fast for small datasets and to be avoided for time critical processes. Hadoop is best for large tasks where time isn’t a constraint such as end-of-day reports or scanning historicals. Complexity – Hadoop is still complex to use and requires specialised programming skills, which can eat into the data cost savings Hadoop offers. However Hadoop is constantly expanding with projects to simplify its use. Not a Replacement for SQL – Hadoop is best suited to processing vast stores of accumulated data while more traditional relational databases are better suited for items like day-to-day transactional records. The above issues are being tackled as Hadoop develops and, in particular, Impala’s developers are aiming to make Impala very usable for more traditional database tasks such as business intelligence applications. Hadoop can be used for automated marketing, fraud prevention and detection, analysis of social network sites and relationships, in-store behaviour analysis in retail and marketing via 3G based on mobile device location. Hadoop is used by many leading-edge Internet companies such as Google, Yahoo, Facebook and Amazon. While Hadoop is slow for small datasets, data needs are growing rapidly at many firms. Tynt, a company that observes web visitor behaviour, processes on average 20 billion internet user events per month. Before using Hadoop, additional MySQL databases were added weekly. Now, with Hadoop, additional storage requirements are managed more easily. Twitter have found that they can’t reliably write to a traditional hard drive given the sheer amount of data it stores – 12TB per day as of September 2010. In addition, they use Pig scripts as SQL can’t perform operations of the scale they require. 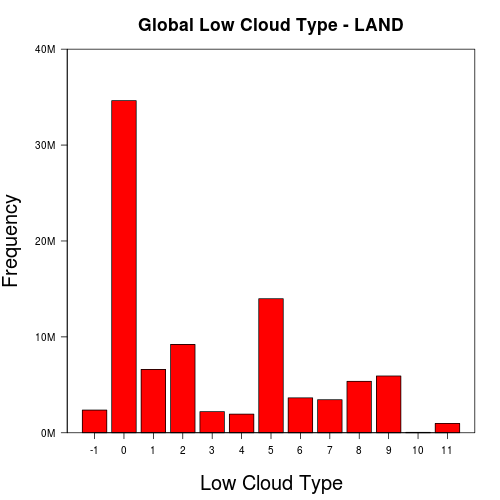 Data is downloaded from the website of the Carbon Dioxide Information Analysis Center, showing cloud and illuminescence data from land weather stations and ocean observation decks around the globe. 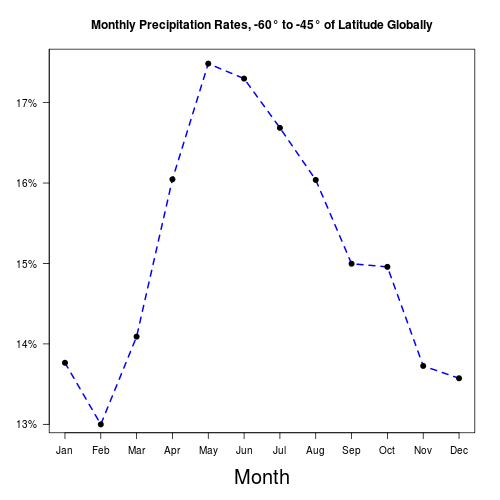 Files cover the period 1 December 1981 to 30 November 1991 with 2 files per month (1 for land observations and 1 for ocean observations) totalling 240 files (10 years x 12 months x 2 files). This is a perfect example where using Hadoop is helpful for data mining. Characters 1-8 Year, Month, Day, Hour 6pm on the 13th March, 1986 is coded as 86031318. Character 9 Sky Brightness Indicator A value of 1 means the sky is bright enough for the report to be used, as it has passed an illuminescence criterion. Characters 10-14 Latitude (x100) The latitude for Dublin Airport is 53°25’N, represented by 5343 (53.43 degrees). Characters 15-19 Longtitude (x100) The longtitude for Dublin Airport is 6°18’W = 353°42’E, represented by 35375 (353.75 degrees). Characters 20-24 Synoptic Station Number The synoptic station number for Dublin Airport is 03969. 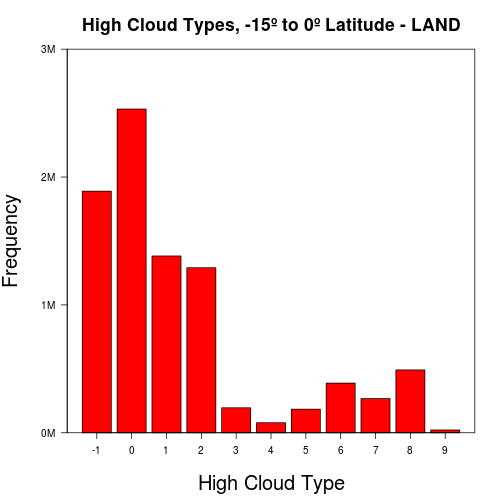 Characters 33-34 Low Cloud Type Indicates if stratus, stratocumulus, cumulus or cumulonimbus are present. 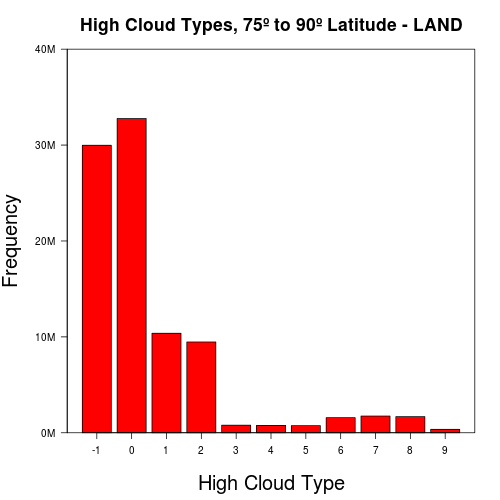 Characters 35-36 Middle Cloud Type Indicates if nimbostratus, altostratus or altocumulus are present. Characters 37-38 High Cloud Type Indicates if cirrostratus, cirrus, cirrocumulus or dense cirrus are present. Although the Cloud Weather dataset is large (c. 2GB) it wouldn’t be considered as “Big Data”, and indeed software such as PostgresSQL and Pandas exist that can handle such datasets. Nevertheless, this is a good example for illustrating how to use Hadoop. However, as files get larger, the R script gets slower. This is for similar reasons to why opening very large files in standard text editors is slow. Hadoop can handle such a task in a better way as HDFS adapts to changes in data structure and can take multiple files as input. Map – the “master” node takes input and distributes it to “slave” nodes, which are all assigned a Mapper. Each Mapper counts the values of pass and fail, which are output back to the master node. The output is tab separated and of the form “keytvalue” where “passt189” means illuminescence was met 189 times at the slave node. Shuffle – Map output is sorted by key. This is, in effect, the “GROUP BY” part of the step, following which only one pass through data is required to get the total values of pass and fail. Reduce – as with the Map phase, the Shuffled output is assigned to Reducers which parse values of pass and fail and aggregate these values up, from which the ratio of “passes” can be derived. 4. Reset count=0 and repeat steps 1-3 for lines where key="pass"
#if not at start of file output latest key count. and then using the same Reducer script from the previous example. The output of this MapReduce job can be read in R using the strsplit function to parse the values vector C_l, from which a histogram can be generated. Exporting files to Amazon S3, Amazon’s Elastic MapReduce platform (which includes Streaming) offers the opportunity to use the above approach to make several observations. 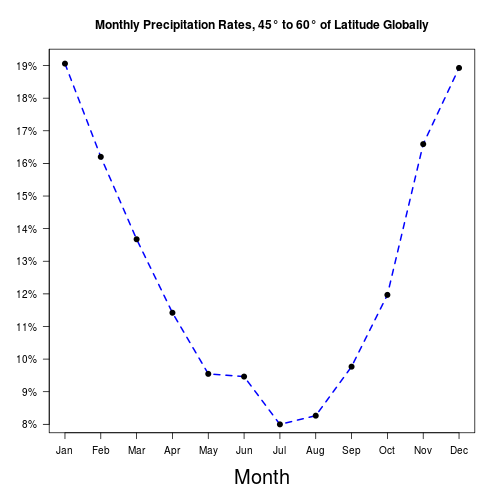 There were a total of 138,886,548 weather reports in the 10 year period, 124,164,607 made from land and 14,721,941 made from ocean, which corresponds with the documentation. 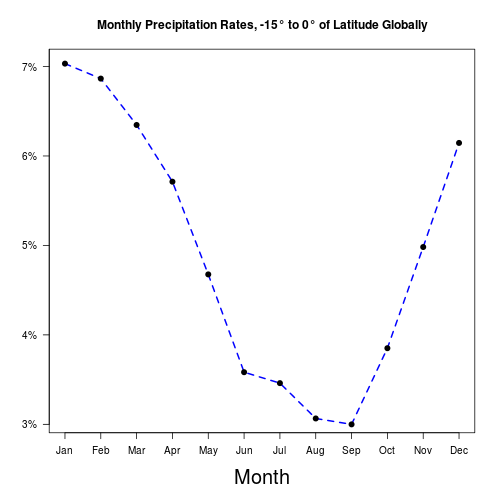 In terms of the illuminescence criterion, 27.2% of all land reports and 24.6% of ocean reports failed it, showing little variability between land and ocean reports. 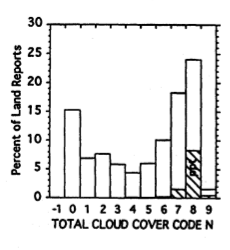 We note that cases of missing cloud data (Total Cloud Cover of -1) and obscured skies (Total Cloud Cover of 9) were removed before publishing online and hence are not in the graph on the left. Otherwise the 2 graphs are proportionally similar. 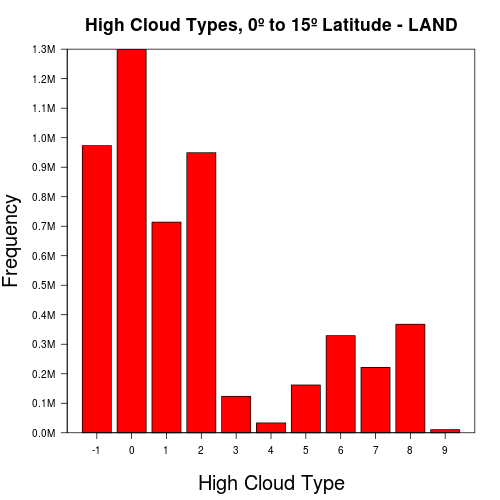 We see the same result for all other cloud features, indicating the MapReduce algorithms are working correctly. 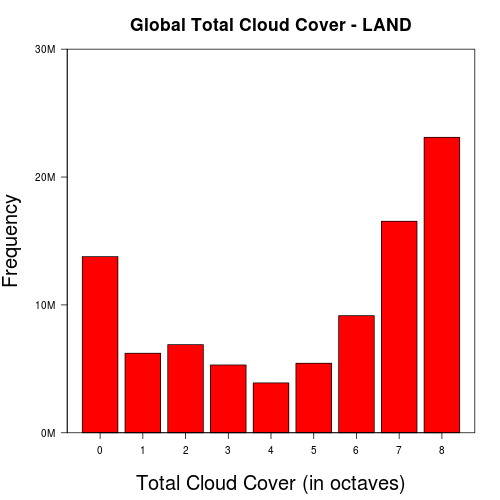 Similarly, total cloud cover and lower cloud base height tend to be in the higher octaves on ocean than on land. 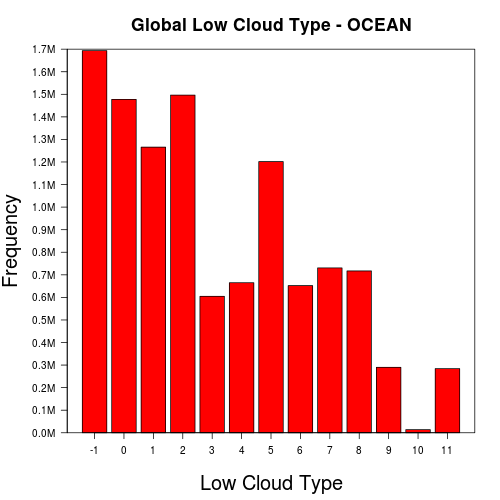 Again, errors in data for these cloud features are more frequent on ocean than on land. 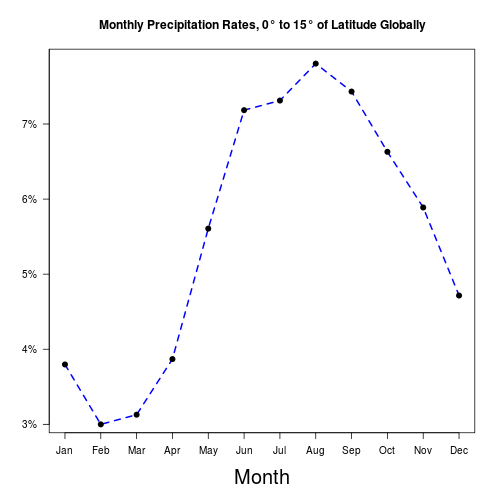 Using the documentation and the values of month, present_weather and latitude it is possible to show monthly precipitation trends. Weather reports include land station and ocean deck codes, allowing filtering on a more local level. 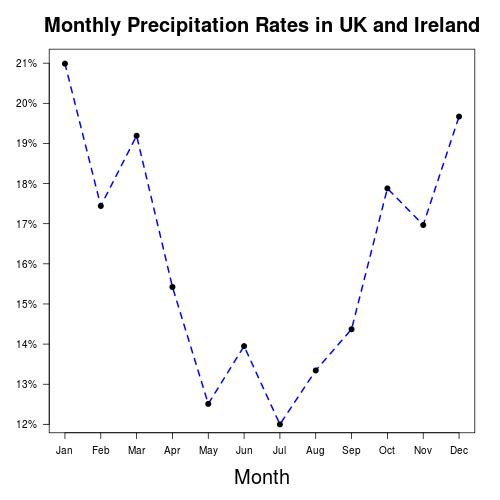 For example, all land weather stations in the United Kingdom and Ireland have the prefix “03” in their 5 digit number e.g. Dublin Airport is represented by the code 03969 and London Gatwick is represented by the code 03776. 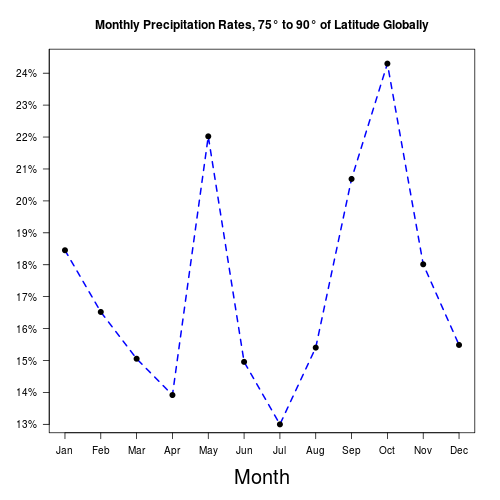 In R the if clause if(grepl(“03”, stat_deck)) filters stations in the United Kingdom and Ireland, where stat_deck <- as.integer(substr(line,20,24) is the weather station code. 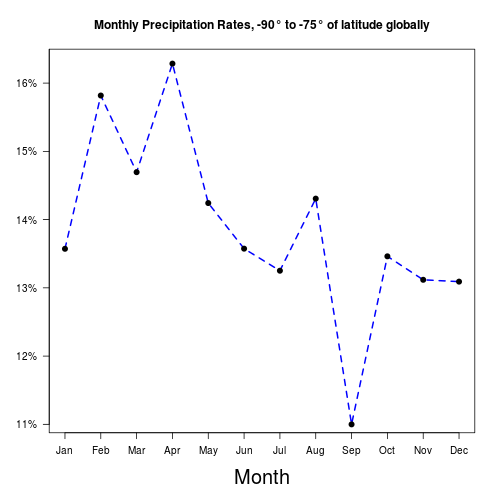 The following plot of UK precipitation levels shows a similar trend to that seen globally in the region between latitudes of 45 to 60 degrees North.